Home » NEWS » I’m a geophysicist. My signature fieldwork uniform is bright pink. admin February 12, 2019 February 12, 2019 No Comments on I’m a geophysicist. My signature fieldwork uniform is bright pink. Pink won’t fix the systemic sexism in the sciences, but it also won’t hinder the development of anyone’s skills. My boots for fieldwork are the essence of pragmatism, with tall shafts, sharp metal spikes for grip on slippery forest floors, and steel toes for safety, all in bland navy. They’re pure function, with no leeway to form. That is, until you get to the glittery pink laces. I’m a field geophysicist. Basically, that means I go out into remote areas, ride around in helicopters to reach even more remote mountain peaks and glacial valleys, then spread out an array of delicate electronics and hope it doesn’t all short out in the rain or get chewed on by a bear. I hit a big red button to trigger anything from an electric shock to an explosion, listen carefully for how that signal gets warped by the Earth, then invert that data to pry into subsurface secrets. It’s a fascinating mix of James Bond villain and MacGyver, a blend of geek and jock, and the perfect job for someone who loves the beauty of math but can’t resist the call of the wilderness. It’s also one of the many science fields where women are a rare sight. I was always going to stand out among the burly, gruff men who make up most of the transient inhabitants of the mines and exploration camps I go to for gigs. But it didn’t take me long to embrace pink as my signature color during fieldwork, standing out even more prominently in a sea of drab olive greens, matte blacks, muddy browns, and sharp neon orange high-vis gear. The author in her signature color. My foray into pink field gear started in my toolbag as an anti-theft deterrent after one too many of my field knives never made it back from lending out to crew for stripping and splicing wire. I bought a pink knife as an experiment, and when it survived an entire gig, I loaded up on pink flagging, purple electrical and duct tape, and even dusky rose pink gloves. I grew even more excited when I realized how clearly pink stood out when I inevitably dropped a tool in the musty detritus of a forest floor. The next phase of my evolution was a hardhat. Hardhats on work sites follow a color code: white for supervisors, green for safety officers, yellow for construction, and so on. Pink falls nowhere on this scale, although some sites have a loaner pink hardhat to bestow as punishment for the forgetful, careless, or simply new. I don’t see wearing a feminine-coded color as punishment and I like being visible at long distances, so on went the pink hardhat. 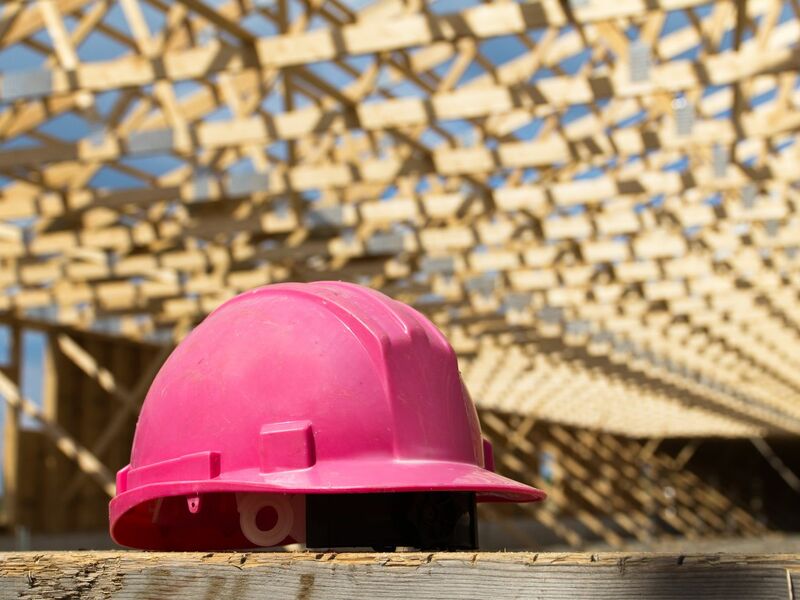 Then one of my coworkers told me, “I’d never wear a pink hardhat because it would instantly undermine my credibility.” Yes, I was wearing a pink hardhat at the time. Yes, she, too, was one of the few women in this rough-and-tumble industry, although her coping method seemed to be blending in to the dominant culture while mine was aggressively pink confrontation. Yes, I wrote down the exact phrasing to never, ever forget it. 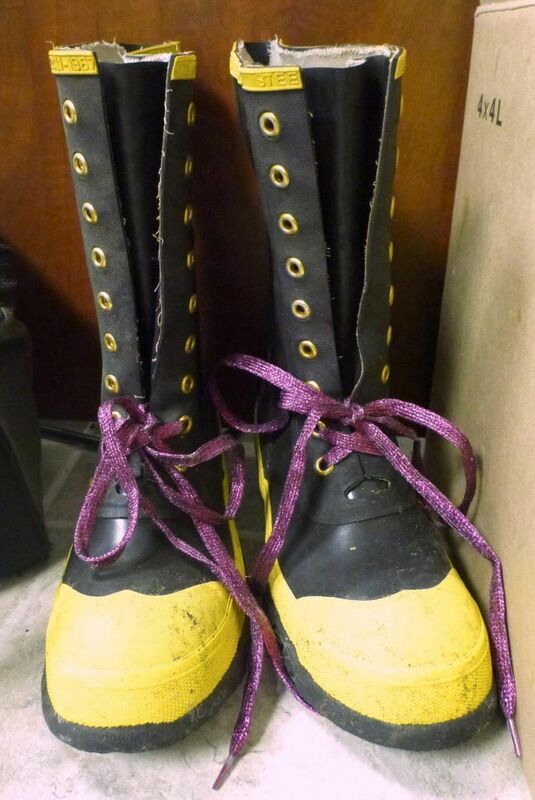 The next day, I laced pink glittery laces into my steel-toed rubber calk boots. After chatting with helicopter pilots, my signature pink transitioned from ornery defiance into the smart safety choice. Pink is gorgeously, delightfully, perfectly visible from long distances (or when piled in a heap of muddy rubber work boots). It doesn’t matter if I’m working at a mine, in a forest, on a glacier, or any other landscape — unless I’m in a dense field of wildflowers, nothing in nature is going to camouflage me when I’m in bright pink. 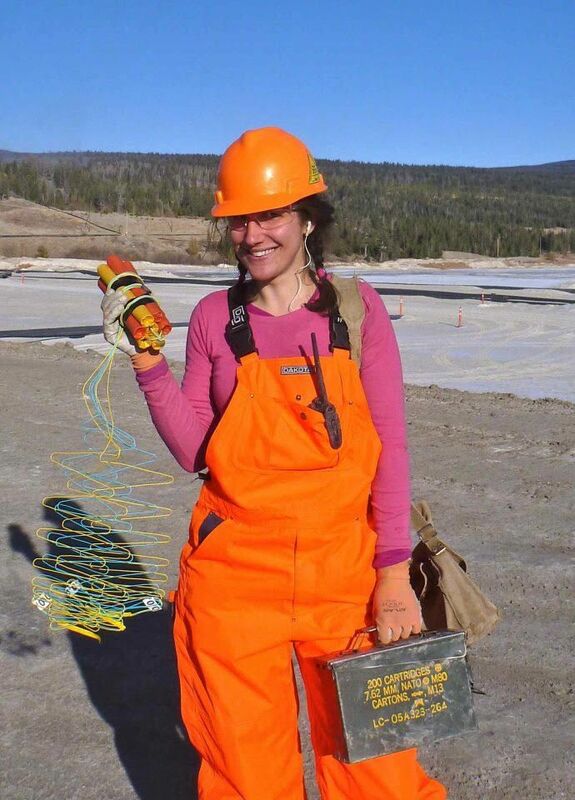 Pink had one last unexpected benefit: My glittery laces and eye-searing hardhat became a filter on the types of people I encountered in the field. If the hint of whimsy brought an involuntary smile to their lips, we’d work well together. But if they couldn’t help but express their scorn, I learned up front who thought the mere touch of a feminine color inhibited competence. I waved a pink flag antagonizing those who resented having a woman in the field running a geophysics crew, and when they charged and snorted their displeasure, I could strategize coping techniques to get the job done instead of getting blindsided by their sexism later. The very reasons pink is met with such hostility during fieldwork is the same reason it smothers even the science section of toy stores. Pink is a gender-coded color, one first relegated to boys as a paler red far too passionate for little ladies, then just a few decades later assigned to girls and declared hue non grata for those wishing to project the manliest of manly aesthetics. While I’ve yet to understand how children’s toys can be “for” boys or “for” girls unless they’re being used in an adults-only manner, marketers have no such hardships. Science kits “for” girls are inevitably emblazoned with pink. At best, these cotton-candy kits contain the same experiments as the blue “boys” kits, possibly each plastic piece within pinkified to match the exterior case. At worst, the blue box of volcanoes and goop is mirrored by a hot pink case promising DIY cosmetics and soap. This pinkification extends beyond the toy store and into campaigns ostensibly to recruit girls into science, technology, engineering, and mathematics (STEM) as though a bubbly pink font were the only obstacle to why women are so painfully underrepresented in senior levels of these fields. But pink is just a color. Pinkificiation of science isn’t some panacea that will fix systemic sexism that convinces little girls they aren’t good at math, nor will it remove the institutionalized harassment that drives women out of science as the years of injustice grind them down. Pops of pink may soothe my raging soul as a quiet rebellion, but it won’t erase the cultural attitudes driving me to muffle my screams of frustration into a rictus smile that passes for polite. Pink doesn’t inhibit critical thinking skills. It doesn’t destroy analytical ability. As long as you’re using your personal protective equipment properly, it doesn’t impact data collection. I can wear pink and still be a scientist, even one doing fieldwork. I don’t dream of a future where every scientist and engineer wears pink when doing their work, irrespective of gender identity. Instead, I dream of a future where we finally realize aesthetics and competency are independent factors in who we are, where personal fashion choices — glam, punk, haute couture, rockabilly, bohemian, preppy, princess, or anything else — are independent of perceptions of scientific competency. The pinkification to lure girls into science, technology, engineering, and mathematics is deeply sexist, but so are attitudes that declare feminine choices are incompatible with being smart or doing science. And if someone thinks pink undermines my credibility? That’s their baggage, not mine.